This proposal was submitted in 1978 by Trudy Carson prior to the creation of this reserve . The Kerouard Islands are located between Hecate Strait and the open Pacific Ocean, at the southern-most tip of the Queen Charlotte Islands. Isolated, rugged and extremely wild, these islands and their associated waters provide habitat for multitudes and diverse life-forms. Besides having major breeding colonies of sea-birds and marine mammals, the Kerouard Islands may be a critical region along the northwest marine mammal and bird migration corridor. The Kerouard Islands and Cape St. James are known, not only for being the windiest spot in Canada, but for their violent tide channels, converging currents and cold water upwellings. These upwellings provide food for flocks of birds, marine mammals and an array of sub-tidal organisms. Numerous species of whales including the Killer Whale Pygmy Sperm and the Grey Whale (D. Robinson) have been sighted in the waters adjacent to the Kerouards. The sea-otter (Enhydra lutra) thought to be extinct on the Queen Charlottes since has been sighted here on two occasions (D. Robinson and D. Usher). The western most island in the Kerouards supports one of B. C. ‘s – largest breeding colony of Northern Sea-Lions, Eumetopias jubata. 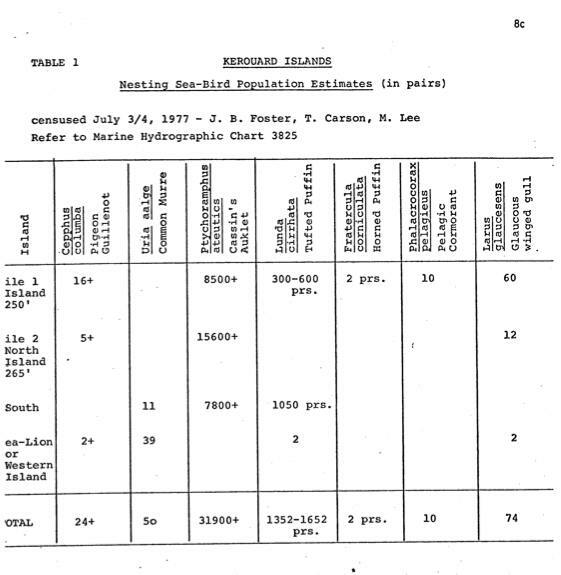 A• Federal Fisheries census conducted June 30, 1977 just after pupping, counted 303 Pups and 782 Adults and Sub-Adult Sea-Lions. A study on this population and the behavior of these Sea-Lions was undertaken by. Clayton Brenton who has completed a. Master’s of Science thesis under Dr. Dean Fisher. Although this magnificent mamma], forms an integral part of the marine ecosystem, little protection is offered for the sea- lion in British Columbia. (250’) and “Mile 2” (265’) Islands. Burrows riddled the moist organic soils and were hidden beneath incredibly lush clumps of Calamagrostis nutkaensis. This grass attained heights of over 5’ (normally grows to about 2 ft) probably due to the highly nitrogenated soil. It was estimated that more than 31,000 pairs of nesting Cassins Aukiets and more than 1350 pairs of Tufted Puffins nest on the Kerouard Islands. The Kerouards may be situated along a northwest migration corridor. Passerines, shore-birds, and marine birds such as Scoters, Phalaropes, and Shearwaters are known to migrate along the west coast of the Charlottes. Numerous bald eagles and a pair of Peregrine Falcons were observed on the Kerouards. A peregrine falcon eyrie on the Kerouards has been reported. The sub and intertidal marine life on the rugged shores and benthos of the Kerouards shows exceptional diversity and richness due to the surges, tidal currents and upwellings in the area. During a brief examination at low tide on July ~, 1977, varieties of brightly coloured sponges, algae, anthozoans and molluscs were noted. To conserve undersea life a reserve boundary following the 20 fathom line is recommended. The Kerouard Islands are isolated, steep and highly dissected islets. This factor, along with the predominance of poor weather has kept the Kerouard’s fairly inaccessible to man. Aside from a small research shack on Sea Lion Rocks, the Kerouards show no sign of human impact. In contrast, St. James Island, inhabited since 1913 by meteorological staff, is infested with rats which presumably have caused significant declines in nesting sea-bird colonies. There have been reports of Sea-Lion shooting incidents on the Kerouards. It is imperative that the significance of the Kerouard Islands be recognized and protection status acquired. Ecological reserve status for this area covering approximately 12.7 hectares of land and 76 hectares undersea, is strongly recommended.